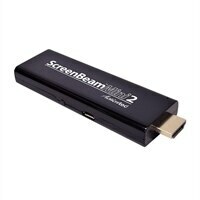 With ScreenBeam Mini2, you can enjoy your favorite photos, videos, and movies on the best display in the house. Simply connect the tiny adapter to your high-definition TV and you can wirelessly display content from a compatible laptop, tablet, or smartphone. That means you can sit back and watch movies you've downloaded from Netflix, Hulu Plus, Amazon, or YouTube on your TV. You can share your vacation photos with friends or view a spreadsheet on a large HDTV without having to stare at a tiny screen.